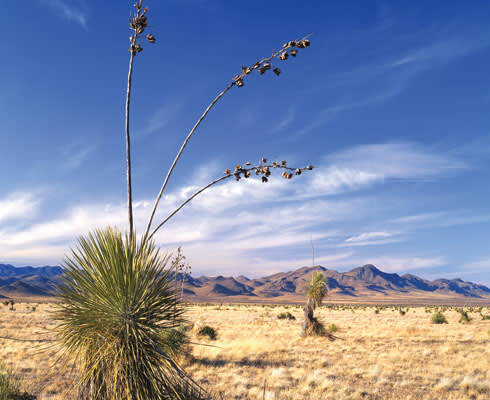 Above: A scene from the Bootheel in southwestern NM: a majestic yucca in the Playas Valley, with the Animas mountains in the background. Bootheel excitement—and beauty—lie always just around the bend. Granite boulders frame agave stalks and both turn distant mountains into paintings. Saw-toothed edges show white, like lace, on sotol. Yucca raises statuesque flower plumes against the blue sky, while prickly pear, cholla, ocotillo, barrel cactus, and the “crown of thorns” compete colorfully along the ridges and in the swales. At times whole townships are awash with the tantalizing dry scent of mesquite in bloom, suggesting illusive, invisible honeysuckle. Desert willow and hackberry choke some draws, sweet with their own blossoms and fruits, swarming with insects. At night along these ridges and in these draws the poorwill tolls the hour.